National Rivet welcomes orders for custom engineered rivet setting machines. Our engineers can design the ideal riveter or rivet setting system to fasten intricate shapes, extremely small or large pieces and complicated assemblies. We can also adapt standard machines by equipping them with special arms, feeding devices for rivets and parts, customized fixtures and compensators. 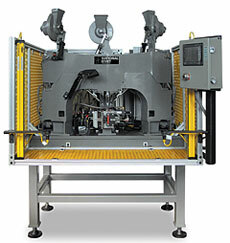 To see examples of custom engineered machines, click here. Let us create a unique fastening solution for you today! Specializing in Adapted & Custom Machines.